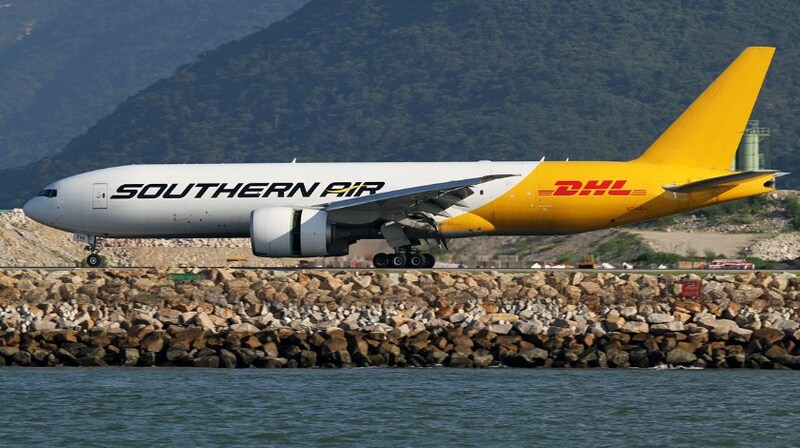 Boeing and DHL announced that the leading international express carrier has placed an order and commitment for 14 Boeing 777 Freighters, and purchase rights for 7 additional freighters. The $4.7 billion order agreement, at current list prices, was unveiled at the opening of the 2018 Farnborough International Airshow. A portion of the order was previously unidentified on Boeing’s Orders & Deliveries website. When the full order is finalized, it will also appear on the website. “We are delighted to announce the acquisition of 14 new 777 Freighters as we renew part of our long-haul fleet with this best-in-class fuel efficient freighter type that will make a significant step towards DHL’s zero emissions target by 2050,” said Charlie Dobbie, Executive President of Global Network Operations & Aviation. DHL was the first express operator in 2009 to introduce the 777 to perform long-haul time critical services. The aircraft type has proven to be the most reliable large freighter connecting the major markets across the globe, bolstering service quality for DHL’s express customers. The new order will double the size of DHL’s global 777 fleet, allowing more markets and customers to benefit from the uniquely capable aircraft. “The 777 Freighter is an airplane perfectly suited to DHL’s needs, offering an outstanding payload capability, with incredible range to service its extensive intercontinental network and unmatched reliability,” said Boeing Commercial Airplanes President & CEO Kevin McAllister. Global air freight demand grew by nearly ten percent last year with demand growth outpacing capacity growth by a factor of three. Expanding cross-border e-commerce sales for instance will grow to $4.48 trillion by 2021, which means a growth of 19.2 per cent per year. DHL’s investment in the 777 Freighters is a direct answer to the growing demand for global express capacity.